Readers often remind me that I need to ride Ottawa County more often. I took their advice last month and hit the road out of Zeeland toward Hudsonville. I began at the Paw Paw Foot Bridge. The bridge is marking 10 years since it was constructed at the end of Paw Paw Drive over the Macatawa River. The bridge is in the same place where a vehicle span once stood before the portion of Paw Paw Drive was vacated between 104th and Main avenues. The structure’s arcs and the twisting path heading up to Main Avenue are photogenic. In fact, I came across someone having what I assumed to be her senior portrait taken when I mistakenly pedaled through one of the photographer’s frames. I hope he got my good side! Main Avenue in the city is under construction, but I wound my way through it. 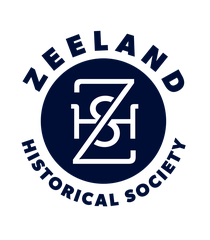 Later that day, I stopped in at the Dekker Huis/Zeeland Historical Museum at 37 E. Main Ave. The museum is open 10 a.m. to 7 p.m. Thursdays and 10 a.m. to 2 p.m. Saturdays. Admission is free. Downtown Zeeland is always a nice ride, but getting in and out can be confusing. I had a tough time finding the foot bridge, for example. No signs pointed me to the site, so I had to stop at a garage and seek directions from the mechanics. They were friendly — the mark of a strong community — and patient as they pointed me to the park. Getting out of the city was confusing as well. I was aiming for Byron Road, but mistakenly followed the signs to Chicago Drive. That was a harrowing misadventure. I finally turned around after hitting a few dead-end cross streets then had to rattle my way over speed bumps and cross Saturday morning traffic to get in the left lane at the traffic signals. Having to make the mind-numbing boulevard turn to get to eastbound Byron Road was the just the beginning of a hair-raising ride. I don’t often advise riders to avoid roads — 58th Street between 136th Avenue and Fennville is the only one I can think of — but I advise staying off Byron Road. No, I don’t advise it. I plead with you not to ride it. Really. As I headed under the I-196 overpass, I thought I was going to be the meat in a car sandwich. I had cars to my right entering the highway and cars on my left — in my lane — whipping east. Not one driver slowed down or moved over. This was just the beginning a ride that had me thinking I was going to be eating asphalt. Byron Road has no paved shoulder and the cars move like they were shot out of a gun. I was actually shaking after a red pickup came up behind me and didn’t move an inch in the lane as a flat-bed truck loaded to the brim with bales of hay came from the other direction. I felt the wind from that pickup’s mirror buzz my ear. By the time I reached Jamestown Township and the paved shoulder thankfully emerged, I was ready for a few deep breaths and a break to steady my psyche. Next week: A glimpse of the Interurban era.